I recently wrote two posts for the Sound Money Project about Swedish monetary innovation. The first is about an effort by the Swedish central bank—the Riksbank—to force retailers to accept cash, and the other is about the e-Krona, a potential Riksbank-issued digital currency. This post covers a third topic. For many years now those of us who are interested in cash, privacy, and payments have had our eye on Swedish banknote demand. The amount of paper kronor in circulation has been declining at a rapid pace. Many commentators are convinced that this is due to the rise of digital payments. Since Sweden is at the vanguard of this trend, it is believed that other nation's will eventually experience similar declines in cash demand too. But I disagree. While digital payments share some of the blame for the obsolescence of paper kronor, the Riksbank is also responsible. The Riksbank betrayed the Swedish cash-using public this decade by embarking on an aggressive note switch. Had it chosen a more customer friendly approach, Swedes would be holding a much larger stock of banknotes than they are now. 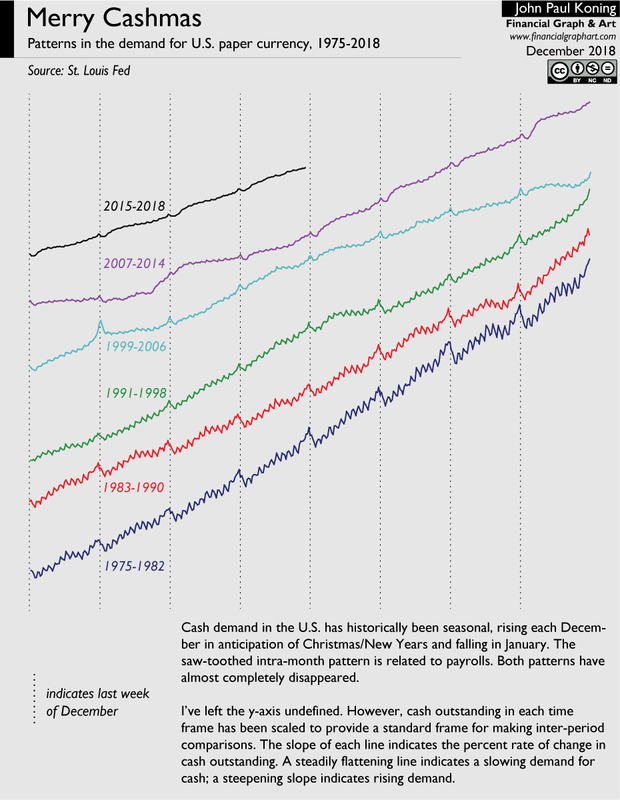 As long as other countries don't enact the same policies as Sweden, they needn't worry about precipitous declines in cash demand. The BIS has a good explanation for this seemingly contradictory pattern. The demand for cash can be split into two buckets: means-of-payment and store-of-value. Banknotes earmarked as a means of payment are generally spent over the next few days. Demand for this type of cash is stagnating thanks to increased card usage. Not so the former. The demand to store $100 bills under mattresses and in safety deposit boxes in anticipation of some sort of disaster is booming. According to the BIS, this is due in part to low interest rates, which makes banknotes more attractive relative to a bank deposit or government bond. The number of banknotes held as a store-of-value demand accounts for quite a large proportion of total cash in circulation. In a recent paper, Reserve Bank of Australia researchers estimated that 50% to 75% of Australian banknotes are hoarded as a store of value. Keep in mind that these sorts of calculations are subject to all sorts of assumptions. Australia's experience with cash probably applies to most other developed nations. Sweden, a sign of what's to come? Surprising, but for the first time in years, the number of Swedish krona banknotes in circulation is growing. Even Norway, which has probably proceeded further along the path of digital payments than Sweden, has experienced only a small decline in notes outstanding, nothing akin to Sweden's white-knuckled collapse. The key question is this: why have most developed nations experienced digital payments renaissances along with stability in cash demand, whereas Sweden's own renaissance has been twinned with a seismic drop in cash demand? The answer to the question is important. Many commentators (including Ken Rogoff) are convinced that the rest of the world's nations will eventually find themselves in the same situation as Sweden. The allure of digital payments will inevitably lead to an all-out Swedish-style desertion of cash. I'm not convinced. As I mentioned at the outset of this post, the Riksbank shot itself in the foot by carrying out an aggressive currency swap between 2012-2017. This swap did incredible damage to the paper kronor "user experience", or UX. In response, discouraged Swedes fled from cash and substituted into less awkward alternatives like bank deposits. Let's take a closer look at Sweden's 'great note switch'. Every decade or two central banks will roll out new banknotes with updated designs and anti-counterfeiting measures. This is good policy since it cuts down on fake notes. These switches are generally carried out in a way that ensures that the public's user experience with cash remains a good one throughout. The best way to maintain cash's UX during a changeover period is to allow for long, or indefinite periods of concurrent circulation between old and new notes. Concurrent circulation cuts down on confusion and hassle endured by note users. Let me explain with an example. Up here in Canada, the Bank of Canada introduced polymer banknotes between 2011 and 2013. But no time frame was placed on the demonetization, or cancellation, of previous paper $5, $10, $20, $50, and $100 notes. Since we all knew from the get-go that we would be free to spend or deposit old Canadian banknotes whenever we got around to it, we didn't have to go through the hassle of rounding up old notes stored under our mattresses and bringing them in for new ones. Apart from the novelty of polymer notes, we hardly noticed the switch to polymer. Not so with Sweden's rollout of new banknotes. Rather than allowing for a long period of concurrent circulation between old and new notes, the Riksbank announced a shot-gun one-year conversion window for legacy notes. After that point, all old notes would be declared invalid. For instance, the new 20, 50, and 1000-krona notes were all introduced on October 1, 2015. Swedes had until June 30, 2016—a mere 273 days later—to spend the old notes at retail outlets, after which it was prohibited for retailers accept old notes. If they had missed that window, the Swedish public then had another 62 days—till August 31—to deposit them in banks. After that, all old 20, 50, and 1000 notes would invalid. Owners of invalid banknotes could bring them to the Riksbank, fill out a form explaining why the due date had been ignored, and for a fee get valid ones. The same shot-gun approach characterized the rollout of the new 100 and 500 the following year. Swedes had 273-days to spend old 100 and 500-krona notes, and another 365 days to deposit them at banks. The October 2015 and 2016 switches were preceded by a preparatory demonetization in 2012. At the time, Sweden had two types of 1000-krona note in circulation. 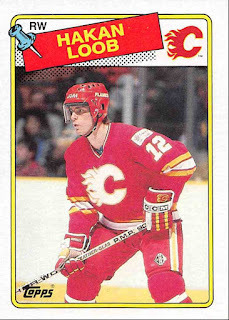 The version that had been introduced in 2006 had a special foil strip to combat counterfeiters, but the 1989 version did not. In November 2012 the Riksbank announced that Swedes would have 418 days—till Dec 31, 2013—to use old 1000 notes without foil strips. After that date the notes would be invalid. That outlines Sweden's hectic changeover timeline. Now, let's go back to 2012 and put ourselves in the shoes of Hakan, a Swede who has stashed a few 1000-krona banknotes in anticipation of emergencies or other exigencies. In 2012, Hakan would have learnt that all of his 1000-krona notes without foil strips would have to be replaced or declared invalid. How to deal with this annoyance? Hakan could have replaced them with 1000-krona notes with foil strips, but the Riksbank had also communicated that notes with strips were to be invalidated by 2016. Replacing them with 500 notes would be equally inconvenient, since these were scheduled to be replaced in 2017. Rather than committing himself to a string of inconvenient switches, Hakan may have simply given up and deposited his notes in a bank. Note the massive 50% decline in 1000-krona notes outstanding between the end of 2012 and 2013. Granted, the 1000-krona was already in decline prior to then. But without the aggressive 2012-13 demonetization, this decline would have been much less precipitous. Even more glaring is the drop in the number of 500-krona notes beginning in 2015 as the conversion period approached. Rather than swapping old 500-krona notes for new ones, or 1000-krona notes, Swedes instead choose to deposit them in the bank. After enduring a stream of inconvenient note exchanges, were cash users like Hakan simply sick of their product expiring on them? Neighbouring Norway serves as a good control or benchmark for studying Sweden. Both nations have similar tastes for digital payments and cash, identical banknote denomination structures, and their currencies trade close to par. But unlike Sweden, Norway did not implement a massive note replacement effort. This gives us some clues into how Sweden's switch may have affected demand for the paper kronor. Below I've separately charted the evolution in the value of each nation's stock of 500 and 1000 notes, and the combined large denomination note stock (1000s + 500s). During the 2015-2017 changeover period, demand for Sweden's 500-krona note plummeted, but uptake of the Norway's 500-krone note continued to grow nicely (first chart). The aggressive demonetization of 2012-13 coincided with a big drop in the quantity of Swedish 1000-krona notes. Meanwhile, the rate of decline in the quantity of Norwegian 1000-krone notes continued as before (second chart). What message do I take from these two charts? Given two otherwise equal nations, the one that subjects its citizens to an aggressive note swap will experience a large decline in the popularity of the targeted note. As for the last chart, the total value of Swedish high denomination banknotes was once twice that of Norway's count. But it is now equal to that of Norway, despite the fact that Sweden has twice the population. My guess is that if the Riksbank hadn't inflicted a series of aggressive demonetizations on Swedes, folks like Hakan could have blissfully ignored the entire changeover, and Sweden would still have a much bigger note count than Norway. The black dotted line gives a hint of where Sweden might be now if the pre-changeover trend in kronor banknote demand had continued. Why did the Riksbank betray the Swedish public? You can't, because it was a gentle switch, one that didn't hurt cash's UX. Patriotic Swedes might counter that Sweden isn't Canada, it has its own way of doing things. But during previous Swedish note introductions, long windows of concurrent circulation were the standard. For instance, when the 1000-krona note that was printed from 1952-1973 was replaced by a new 1000 note in 1976, the legacy note remained valid for more than ten years after that, until Dec 31, 1987. And when the next series of 1000-krona notes was rolled out in 1989, the legacy note was accepted until December 1998. Long windows, not short ones, is the Swedish tradition. "...the old banknotes and coins to become invalid after a relatively short period so that they could avoid having to manage double versions of the banknotes and coins for an extended period." These same market participants also requested that the Riksbank demonetize the old 1000-krona notes without foil strips. Removal of this older series meant one less version to manage once the new 1000-krona note was debuted in 2015. Market participants also hoped that the old banknotes wouldn't be exchanged for new ones, thus reducing the total amount in circulation. If you are wondering why bankers might want fewer banknotes outstanding, go read my 'conflict of interest' section a few paragraphs below. "The Riksbank was aware that the timetable would lead to complications for the general public in that there would be a number of different dates to keep track of. The need for information activities would be increased. However, the Riksbank considered that the interests of the cash market were more important..."
Now, if the Riksbank had justified the shot-gun switch as a way to flush tax cheats out, I might be more sympathetic. At least an argument could be made that the public's welfare was being served by imposing a series of inconveniences on them. But as the above quote indicates, the motivations for quickly invalidating old notes was much less nuanced than this. The Riksbank deemed that the 'complications' that the general public had to endure simply weren't as important as the 'interests' of the banks. Full stop. There is a huge conflict of interest involved in consulting with banks about cash's future. Sweden's bankers would have been quite pleased to provide the most awkward timetable imaginable. After all, they would have been the main beneficiaries. The more Swedes who forsake cash to pay with cards, the more fees banks earn. Furthermore, each kronor that is held in the form of cash is a kronor that isn't held at a bank in the form of a deposit. Banks lust after consumer deposits because they are a low-cost source of funding. One wonders if the Riksbank fully understood this conflict of interest. The decline in the kronor count has finally been reversed. In the tweet I embedded above, the amount of paper kronor in circulation rose in 2018, the first increase in many years. 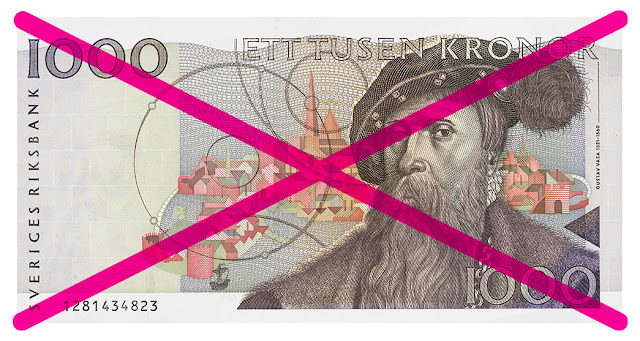 The impositions on the the kronor's UX over the last five years are finally drawing to a close. Now that they no longer have to worry about timetables and expiry dates, are Swedes like Hakan finally returning to the market? "There are those who think we have nothing to fear in a world where public means of payment have been replaced completely by private alternatives. They are wrong, in my opinion. In times of crisis, the general public has always sought refuge in risk-free assets, such as cash, that are guaranteed by the state. The idea of commercial agents shouldering the responsibility to satisfy public demand for safe payments at all times is unlikely." The Riksbank may even roll out an e-Krona, a digital currency designed to meet Swede's desire for "continued access to a means of payment that is risk-free and guaranteed by the state." Odd that Ingves is now so concerned about Swedish access to a risk-free payments medium when he was so willing to ignore the interests of Swedish cash owners just a few years before. Sweden will probably have to go through another note switch sometime in the late 2020s. I hope that when it comes, Swedish bankers will get a little bit less representation at the table and the Swedish public a bit more. As for concerned citizens and central bankers in other countries that are planning to introduce new notes, we can all learn some lessons from Sweden's 2012-2017 changeover. Aggressive note switches may be good for private bankers, but they hurt cash-using citizens. The long-window approach to note switches, not Sweden's shot-gun method, is the customer-friendly approach. Merry Christmas and Happy New Year to all my readers. And to everyone who left a comment this year, thank you. It's always fun to debate things over in the comments section and I feel it makes the blogs themselves stronger. 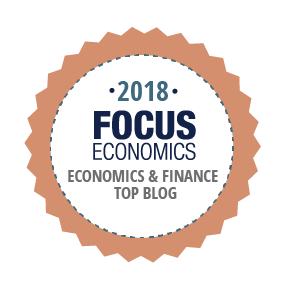 Don't forget to check out the discussion board where we had a number of interesting discussions in 2018. 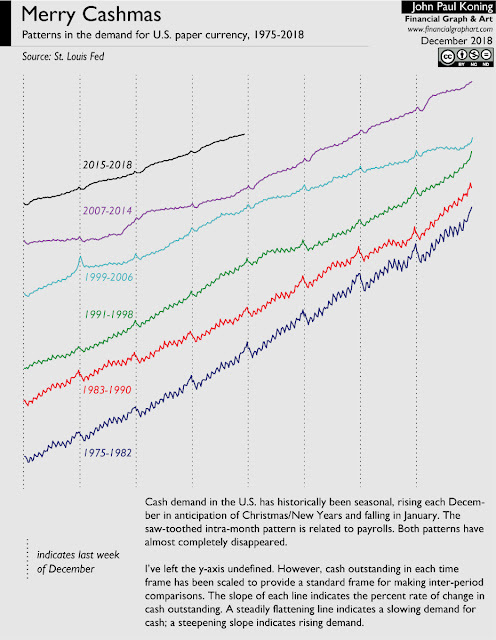 The annual Christmas spike in U.S. banknote demand is getting harder and harder to pick out in the chart. So are the monthly upticks coinciding with payrolls. Most people are getting pretty comfortable buying stuff with cards. And so they are less likely to take cash out of an ATM before the holiday chaos or withdraw grocery money after a paycheck has been deposited. Even though transactional demand for dollars is on the downswing, the stock of Federal Reserve banknotes continues to grow at a healthy pace. The slope of the black line (i.e. its growth rate) may not be as steep as it was in the 1970s, 80s, or 90s, but it is certainly steeper than it was in the 2000s. It is typical to divide cash demand into two buckets. Cash held for transactional purposes gets folded into a wallet. Cash held for store-of-value purposes gets buried in back yards or hidden under mattresses. Continued growth in the demand for U.S. dollars is mostly due to the latter, not only in the U.S. but all over the world. Both the Christmas bump and the sawtooth pattern arising from monthly payrolls are less noticeable than previous years. 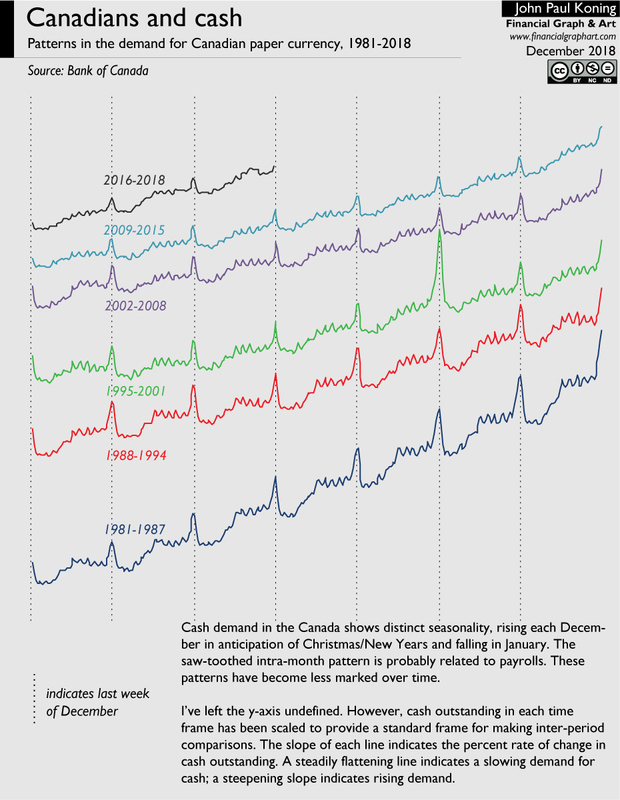 But these patterns remain more apparent for Canadian dollars than U.S. dollars. Not because Canadians like cash more than Americans. We don't, and are probably further along the path towards digital payments then they are. Rather, the percentage of U.S. dollars held overseas is much larger than Canadian dollars, so domestic usage of U.S. cash for transactions purposes gets blurred by all its other uses. Like the demand for U.S. dollars, the demand for Canadian dollars is growing at a healthy rate. So far the slope of the black line (2016-2018) is a bit steeper (i.e. its growth rate is higherr) than all other periods except for the earliest one, 1987-1987. Paper Canadian dollars aren't going away anytime soon. Two older posts got a lot of visitors too. Who knew that Chile's strange indexed unit of account, the Unidad de Fomento, would be a draw? My favorite post of the year was Paying interest on cash. I like this policy. It helps the lower-income and unbanked earn interest. It also provides a means for central bankers to promote cash usage, which in turn helps keep financial privacy alive. And economists should like it, since it fulfills the Friedman rule. Bitcoin Is Perfect for Cross Border Payments (Except for One Big Problem) - Why I don't use bitcoin for getting paid. The future of cash: Iceland vs Sweden - We always assume that Scandinavians are moving away from cash, but Iceland shows that this isn't the case. Pricing the anonymity of banknotes - Should financial anonymity be provided in abundance, banned, or should we pay for it? Lastly, R3 just published my paper on a central bank digital currency for Brazil. Many of the points I make apply just as well to any other country. Can lottery tickets become money? Say that the local lottery system has decided to innovate. Lottery tickets can now be used as money. A ticket with a face value of $x can be used to buy $x worth of stuff at any checkout counter in the country. Or they can be held in digital form and transferred instantaneously across the lottery's new payments system to friends, the utility company, or the government tax department. With the payments infrastructure in place, will people actually use lottery tickets to pay their bills, transact with friends, or settle their taxes? Can lottery tickets become money-like? I'm skeptical. Here's my thinking. Say that Jane has just bought $10 worth of digital lottery tickets. At the same time she's chosen to leave $10 in her bank account (she likes the fact that they aren't risky). She spies a coffee stand and suddenly has an urge to buy a $2 coffee. When she arrives at the till, how will she decide to pay? With lottery tickets or deposits? By paying for the $2 coffee with a bit of both—$1 in lottery tickets and $1 worth of bank deposits—she could end up with $9 of each, re-attaining her pre-coffee 50/50 allocation. But let's assume that every transaction is a bit costly to make, both in terms of time to completion and the small fixed fee associated with each payments network. So paying with both will be too expensive. She'll have to choose one or the other. 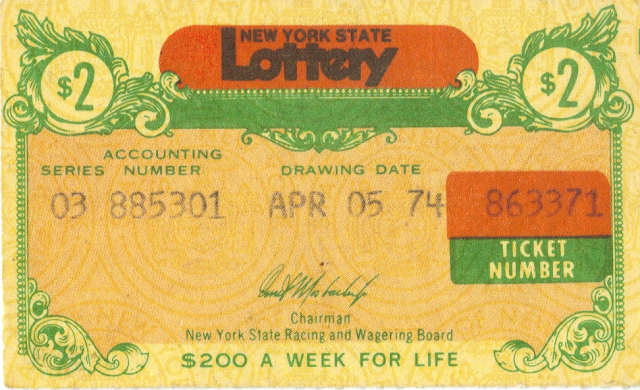 A lottery ticket is more than just a bet. Jane is investing in a fantasy in which she is fabulously rich. So from Jane's perspective, swapping her lottery ticket for a mere cup of coffee would be silly. Once she owns it, her ticket is worth more than hundreds of cups of coffee. A form of Gresham's law kicks in. Given that the coffee seller accepts both lottery tickets and deposits at their face value, Jane will only spend her deposits, which she perceives as being overvalued, while hoarding the lottery ticket, which she thinks are being undervalued by the coffee seller. If every lottery player is like Jane, than 'undervalued' lottery tickets will never circulate as money. Jane could of course consider buying the coffee with lottery tickets only to purchase replacement tickets in time for the draw. But there's always a risk that she'll forget, or not have enough time because something unforeseen suddenly intervenes. By paying with a boring deposit, she doesn't have to fear missing out on a jackpot. If it seems unlikely that Jane will want to purchase the coffee with a lottery ticket, what about Jim, who owns the coffee stand? Would he prefer to receive lottery tickets or bank deposits? Again, a mix of the two instruments would be costly for him to accept given a doubling up of payments processing fees. In the unlikely event that Jim is also a lottery player and hasn't yet bought his tickets yet, then he may prefer that Jane buys a coffee with lottery tickets. Consider that Jim has a constant stream of business expenses ahead of him, but rarely knows precisely when he'll have to make a purchase. Because the lottery tickets will most likely expire worthless in the future, they don't provide him with a suitable means of solving for his future uncertainty. Deposits, on the other hand, will always retain their value. As long as he keeps them on hand, he knows that he can meet his bills. So I think that Jim will probably prefer that Jane pays with deposits. (See more here). In the unlikely event that Jane insists on paying with lottery tickets, Jim will probably acquiesce—the customer is always right. Since he doesn't want to be exposed to the uncertainty of lottery tickets, he will probably try to exchange them as quickly as possible for deposits, but this will be subject to a conversion fee. Anticipating this expense, Jim could very well decide at the outset to incentivize Jane to pay with deposits. He might place a small surcharge on lottery ticket payments, or offer a small discount if customers pay with deposits. Jim might even pretend that his lottery payments terminal is broken. The combination of Jane's reticence to pay with lottery tickets, a form of Gresham's law, and Jim's preference to avoid them will doom lottery tickets as money. Even though the infrastructure is in place for lottery tickets to be transported instantaneously from one person to the other, the incentives just aren't present. Investing in the infrastructure turned out to be a waste of money. I think this setup also explains why bitcoin has never been adopted as a form of money. Like Jane's lottery ticket, a bitcoin owner's bitcoins aren't just bitcoins, they are a dream, a lambo, a ticket out of drudgery. Spending them at a retailer at mere market value would be a waste given their 'destiny' is to hit the moon. Sure, a bitcoiner can always spend a few precious bitcoins on a coffee, only to replenish his stock later in the day. But this would be dangerous, since bitcoin's price could spike at any moment. Far safer to spend one's deposits and hoard one's bitcoins. Even when they claim to be accepting bitcoins, retailers like Jim actually rely on intermediaries like BitPay to step in and purchase the bitcoins while relaying dollars to the retailer. For instance, see last month's post on Ohio tax payments. I also wonder how well my story fits with other examples of volatile media being used as money. For instance, John Cochrane has blogged about a world where one might trade an "S&P500 index share for a candy bar." If lottery ticket buyers and bitcoin owners are consuming a dream, then perhaps an owner of an equity ETF is doing the same. In which case, no one would bother buying candy bars with stocks, and so building out the payments infrastructure necessary to facilitate this would be pointless. While our modern monetary system certainly has plenty of detractors, one of its successes is that we no longer need the services of the local gold regulator. In the late 1700s, the job of a gold regulator was to assay gold coins to determine if they were of the appropriate weight and fineness, modifying (ie 'regulating') the coin if necessary. When he was done, the gold regulator stamped the coin with his seal of approval and put it back into circulation. The job of regulating coins may seem strange to us. But it was an ingenious way to cope with the lack of standardization that bedeviled monetary systems in the 1600 and 1700s, particularly in the colonies. There was no domestic supply of coins in North America back then, so settlers relied on a bewildering array of foreign coins as their media of exchange, each with its own weight and fineness, and most of poor quality. This included not only silver coins such as Spanish dollars, pistareens, and English crowns, but also a gamut of gold coins including Portuguese joes and moidores, English guineas, French Louis d'ors and pistoles, German carolines, and Spanish doubloons. Each of these foreign gold coins was minted with a unique quantity of the yellow metal. For instance, the popular Portuguese half Johannes, or "half Joe", weighed 221 grains and was 91.7% pure when it left the mint, whereas a full-bodied Spanish doubloon weighed 416 grains (one gram equals ~15 grains). Thanks to constant wear and illegal clipping, these coins would inevitably lose some of their mass as they circulated. For merchants, the task of weighing each gold coin that was presented to them, checking if it was a counterfeit, and calculating its appropriate monetary value would have been fatiguing. Let's go through an example of how an American merchant might use this table. Say a customer offers a merchant a slightly worn half-Joe. The merchant measures the coin and discovers that it weighs exactly 9 dwt, or 216 grains. A dwt is a pennyweight, an archaic unit for measuring weights that derives from denarius weight. (1 dwt = 24 grains = 1.55 grams). Let's further assume say this exchange occurred in New York. According to the above table, any half-Joe passed in New York that weighs at least 9 dwt 0 grains is legal tender for £3 and 4 shillings. Look in the columns titled "least weight" and "N. York". So if our merchant happens to be selling horses for £3 4s, then he'd be happy to accept the customer's slightly worn half-Joe as sufficient payment for a horse. But if the half-joe were to weigh less than 216 grains (or 9 dwt), then it would fail to meet the Chamber of Commerce's standards, and therefore the merchant wouldn't accept it—the coin is worth less than the horse's sticker price of £3 and 4 shillings. Testing a coin's weight is easy, but it is unlikely that many merchants would have had the time or expertise to verify its purity. Whereas a Portuguese half-joe was minted with 91.7% fine, a good counterfeit half-joe might be just 88% pure. If a subsequent trading partner questioned a counterfeit's validity, a merchant who had accidentally accepted it could be out of pocket. To remove any doubt, a suspect coin could be brought to the local regulator to be assayed. After removing a small section of the coin, the regulator would then test the coin's gold content. If it was a good coin, he would plug up the test section and stamp his initials on it. Having been approved by a recognized member of the community, the coin could easily pass in trade. This watchdog function reminds me of the part played by Chinese shroffs, or money changers, in the Chinese monetary system of the 17th-19th centuries. 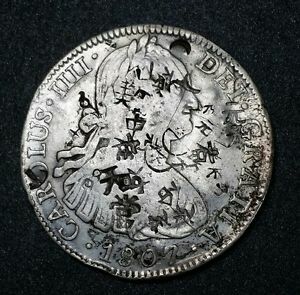 Like North America, China was inundated with a whole range of foreign coins. Local shroffs would assay a foreign coin to verify its silver content. If the coin passed their purity test, a shroff would stamp it with his own peculiar chopmark, usually a Chinese character or symbol. Over time, foreign coins circulating in China might collect multiple chops. The genius of this system is that a naive Chinese consumer could safely accept a strange coin knowing that it had successfully passed the smell test of professional appraisers—and the more chops the better. If you are interested in the Chinese practice of chopmarking, I wrote about it here and here. Testing for fineness is just one theory for the role played by North American gold regulators. There is a second theory. Not only were they watchdogs, but regulators also acted as enhancers or correctors. To see why this might be true, let's delve a bit more into the dynamics in play in North America in the 1700s. If you look at the original table above, notice that the New York Chamber of Commerce listed the minimum accepted weight of the half-Joe as 216 grains. However, as I pointed out earlier, a freshly-minted half-Joe actually weighed 221 grains. So the Chamber of Commerce's standard tolerated the circulation of underweight half-Joes. (They did the same with other coins too, including the doubloon, which when freshly minted weighed 418 grains but was accepted by the Chamber of Commerce at 408 grains.) Providing some extra leeway was probably a wise move. The coins used by New Yorkers came from distant realms and inevitably suffered from wear & tear. But if a half-joe had lost too much of it original heft it would fail to meet the Chamber's standard. This is where a gold regulator might come in handy. Say that a half-Joe was brought to a bank but found to only weigh 207 grains, well below both the Chamber's standard of 216 grains and its original mint weight of 221 grains. The bank would purchase it at discount, say by crediting the customer with just £3 1 shilling instead of the Chamber's standard £3 4s, then send the underweight coin to a gold regulator. The regulator would proceed to cut out a section of the coin and insert a purer (and heavier) gold plug into the hole, bringing its weight back up to the 216 grain standard. The coin in my tweet is a regulated 1747 Portuguese half-Joe. Notice that the plug is slightly raised on the face side of the coin, or the obverse side. On the reverse side of the coin, the plug is rounded and convex. So it apparent to the eye how the plug might add some heft to an underweight coin. Note the flat part at the bottom where the half-Joe has been clipped by a regulator. So a gold regulator's role, whether it be as a watchdog or an enhancer, or a bit of both, was to bring some much-needed order to the chaos of a multicoin monetary system. By bringing a gold coin up to standard, or reducing it to standard, they would have helped ensure the fungibility of North America's coinage. And by stamping their initials on it, regulators provided a guarantee of purity to the public—removing some of the uncertainty involved in accepting unfamiliar coins. By the 1800s, there was no longer a need to have a gold regulators. Most of the deficiencies of the old non-standardized monetary system had been fixed. Paper money had largely displaced gold coins, so merchants had fewer occasions where they had to worry about accepting bad coins. As for smaller denomination silver coins, these were eventually replaced by token coins. The issuer's promise to buy them back at a fixed price, and not their metal content, dictates a token's value. While their time may be past, gold regulators remain a testament to monetary ingenuity. A few months ago Vijay Boyapati asked me to "steel-man" the bubble theory of money. The bubble theory of money, which can originally be found in a few old Moldbug posts, has been used by Vijay and others to explain the emergence of bitcoin and make predictions about its future. So here is my attempt. I am using not only an article by Vijay as my source text, but also one by Koen Swinkels, a regular commenter on this blog. Both are interesting and smart posts, it's worth checking them out if you have the time. 1. Unlike a stock or a bond, which is backed by productive assets, bitcoin cannot be valued using standard discounted cash flow analysis. And since it has no intrinsic uses, it can't be valued for its contribution to various manufacturing processes, nor for its consumption value. Rather, bitcoin is a bubble. Its price is driven by a speculative process whereby people buy bitcoins because they think that other people can be found who will pay an even higher price. 2. There is no reason why bitcoin must pop. At first, bitcoin will be bought by those on the fringe. As more people get in, the price of bitcoin will rise further. It will continue to be incredibly volatile along the way. But once bitcoin is widely held (and very valuable), the flow rate of incoming buyers will fall, and so will its volatility. At this point it has become a stable low-risk store of value. The eventual stabilization of bitcoin's price is a commonly held view among the bitcoin cognoscenti. For instance, bitcoin encyclopedia Andreas Antonopoulos has often said the same thing (i.e. "volatility really is an expression of size"). 3. Once its price has stabilized, bitcoin can transition into being a widely used money, since people prefer stable money, not volatile money. So having steel-manned the bubble theory of money as applied to bitcoin, where do I stand? I agree with points 1 and 3. My beef is with the middle point. Will a Keynesian beauty contest ever stabilize? First off, let me point out that there are elements of the second argument that I agree with. Yes, bitcoin needn't pop, although my reasons for believing so are probably different from Koen and Vijay. In the past, I used to think that a popping of the bitcoin bubble was inevitable. After all, as a faithful Warren Buffett disciple, I believed that the price of any asset eventually returns to its fundamental value, and bitcoin's is 0. But the eternal popularity of zero-sum financial games, or gambles, has disabused me of this view. People are lured by the promise of winning big and changing their lives without having to do any work. Heck, even though a Las Vegas slot machine will take on average 8 cents from every $1 wager, people still flock to insert $1 bills into slots. And so they will play bitcoin too, which like a slot machine is also a zero-sum game. But I digress. The key point I want to push back on is Vijay and Koen's assumption that bitcoin volatility will inevitably decline as it gets more mature. I'm going to accuse them of making a logical leap here. "...each competitor has to pick, not those faces which he himself finds prettiest, but those which he thinks likeliest to catch the fancy of the other competitors, all of whom are looking at the problem from the same point of view. It is not a case of choosing those which, to the best of one’s judgment, are really the prettiest, nor even those which average opinion genuinely thinks the prettiest. We have reached the third degree where we devote our intelligences to anticipating what average opinion expects the average opinion to be. And there are some, I believe, who practise the fourth, fifth and higher degrees." Whether 100 people are participating in Keynes's beauty contest, or 10,000, the nature of the game has not changed—it is still an nth degree mind-game with no single solution. Since the game's underlying nature remains constant as the number of participants grows, its pricing dynamics—in particular its volatility—should not be affected. Why has Amazon stabilized, and will bitcoin do the same? When Amazon shares debuted back in 1997, earnings were non-existent. Jeff Bezos had little more than a hazy business plan. Since then the stock price has steadily moved higher while median volatility has declined. Amazon shareholders used to experience day-to-day price changes on the order of 2.5-4.5% in the early 2000s. By the early 2010s, this had fallen to 1-2% or so. Over the past several years, volatility has typically registered between 0.5-1%. I'd argue that the stabilization of Amazon hasn't been driven by a larger market cap and/or growing trading volumes. Under the hood, something fundamental has changed. The company's business has matured and earnings have become much more stable and predictable. And so has its stock price, which is just a reflection of these fundamentals. I've just told a reasonable story about why a particular asset has become less volatile over time. But it involves earnings and fundamentals, two things that bitcoin doesn't have. I'm not aware why a Keynesian beauty contest, which lacks these features, necessarily gets less volatile as more people join the guessing game. I'd argue that in gold's case a lack of a correlation between size and volatility makes sense. A large portion of gold's daily price changes can be explained by speculators engaging in a Keynesian beauty contest, not changes in industrial demand or earnings (unlike Amazon shares, gold doesn't generate income). There's no good reason to expect that the volatility generated by gold speculators' beliefs should level off as participation in the "gold game" grows. Any game in which speculators base their bets on what they expect tomorrow's speculator to do, who in turn are guessing about potential bets made by next week's speculators, who in turn form expectations about the choices made by next month's players, is unlikely to converge to a stable answer for very long. Will Proof of Weak Hands 3D tokens ever become money? As a third example, let's take Proof of Weak Hands 3D (PoWH3D), an Ethereum dapp that I've blogged about a few times. PoWH3D is a self-proclaimed ponzi game. Basically, a player purchases game tokens, or P3D tokens, with ether. Each player's ether contribution goes into the pot, or the PoWH3D smart contract, less a 10% entrance fee which is distributed pro-rata to all existing P3D token holders. When a player wants to exit the game, their tokens are sold for an appropriate amount of ether held in the pot, less another 10% that is distributed to all remaining players. So if a new player spends one ether (ETH) on some P3D tokens only to sell those tokens an instant later, they'll end up with just 0.81 ETH, the first 0.1 ETH having been paid to everyone else upon the new player's entrance, the other 0.09 being deducted upon their exit. Why would a new player take such a bad bet? Only if they believe that a sufficient number of latecomers will join the game such that they'll get enough entrance and exit income to compensate them for the 0.19 ETH they have already given up. PoWH3D is a pure Keynesian beauty contest. A new entrant's expectations are a function of whether they believe latecomers will join, but latecomers' expectations are in turn a function of whether they believe yet another wave of even greater fools will pile in, etc, etc. Applying Koen and Vijay's assumption that volatility decreases with adoption, then the return on P3D tokens should become less volatile as more people join. It might even transition into a stable investment, say like a blue chip utility stock. Who knows, it could even become a medium of exchange to rival the dollar. But surely Koen and Vijay don't want to walk out on a limb and argue that a pure ponzi game like PoWH3D will ever stabilize. Or that it might become a form of money. I think the most reasonable thing we can say about PoWH3D is that once a ponzi game, always a ponzi game. The volatility of its returns will not decline as the game grows, and that's because the game's fundamentals, its ponzi nature, doesn't vary with size. (If you are interested in PoWH3D, here are some great charts and stats). I haven't updated the chart for two months, but volatility has declined since then. Vijay and Koen will probably say that as of October 2018 bitcoin is less volatile than it was in 2011. That's certainly true. But eyeballing the chart, we certainly don't get the same clean relationship between size and volatility as we do with the Amazon chart. Here's the biggest oddity. By December 2017 bitcoin had reached a market cap of $300 billion, its highest value to date. If Vijay and Koen are right, peak size should have corresponded with trough volatility. But this wasn't the case. In late 2017, bitcoin volatility was actually quite high. In fact, it exceeded levels set in late 2013, back when bitcoin was still a tiny $3 billion pup! The lesson here is that with bitcoin, bigger is just as likely to correspond with more volatility as it is with less volatility. More broadly, when it comes to Keynesian beauty contests there seems to be no fixed relationship between volatility and size. It's chaos all the way down. This leads into Koen and Vijay's final point, that once bitcoin's price has stabilized, it can transition into a widely used money. I agree with the underlying premise that only stable instruments will become accepted by the public as media of exchange. But since I don't see any reason for bitcoin to stabilize, I don't see how it will make the leap from a speculative instrument to a popular means of paying people. Bitcoin isn't on the verge of going mainstream. It's already there. Vijay's message (Koen's not so much) can be taken as investment advice. Because if he is right, and bitcoin has yet to progress to a popular store of value and finally a medium of exchange, then we are still in the first innings of bitcoin's development. Vijay points to what he thinks are the features that will make bitcoin win out against other popular stable assets, including portability, verifiability, and divisibility. Given that only the “early majority” has adopted bitcoin (the late majority and laggards still being far behind), Vijay thinks it would be reasonable for the price of bitcoin to hit $20,000 to $50,000 on its next cycle, and hints at an eventual price of $380,000, the same market value of all gold ever mined. So buying bitcoin now at $6,000 could provide incredible returns. I have different views. Whereas Vijay thinks bitcoin has yet to go mainstream, I think that bitcoin went mainstream a long time ago, probably by late 2013. Bitcoin is often portrayed (wrongly) as a payments system-in-the-waiting, and thus gets unfairly compared to Visa and other successful payments systems. Given this setup, cryptocurrencies seems to be perpetually on the cusp of breaking out as a mainstream payments option. But bitcoin's true role has already emerged. Bitcoin is a successful decentralized gambling machine, an incredibly fun censorship-resistant Keynesian beauty contest. Viewed this way, bitcoin's main competitors were never the credit card networks, Citigroup, Western Union, or Federal Reserve banknotes, but online gambling sites like Poker Stars, sports betting venues like Betfair, bricks & mortar casinos in Vegas, and lotteries like Powerball. By late 2013, bitcoin was at least as popular as some of the most popular casino games, say baccarat or roulette. It had hit the big leagues. Whereas Vijay hints at a much higher price, where do I see the price of bitcoin going? I haven't a clue. But if I had to give some advice to readers, I suppose it would be this. Like poker or slots, remember that bitcoin is a zero-sum financial game (For more, see my Breaker article here). You wouldn't bet a large part of your wealth in a slot machine, would you? You probably shouldn't bet too much with bitcoin either. Vijay could be right about bitcoin hitting $380,000. It could hit $3.80 too. But if it does go to the moon, it will do so for the same reason that a slot machine pays off big. It's worth keeping in mind that when it comes to gambling, the house always wins. Searching around for the lowest gambling fees probably makes sense. As I said earlier, Las Vegas slots will extract as much as 8 cents per dollar. Lotteries are even worse. In bitcoin's case, the "house" is made up of the collection of miners that maintain the bitcoin system. All bitcoin owners must collectively pay these miners 12.5 bitcoins every 10 minutes to keep things up and running. So if you hold one bitcoin and its market value is $6000, you will be paying around 62 cents per day in fees, or $230 per year. That works out to a yearly management expense ratio of 3.8%. Beware, this number doesn't include the commissions that the exchanges charge you for buying and selling. So before you start gambling, consider first whether the benefits of decentralization are worth 3.8% per year. If not, find a centralized gambling alternative. If the costs of decentralization are worth it, then buy some bitcoin, and good luck! But play responsibly, please.